This book will provide you with a complete guide through all of the stages required to develop your own games for the Windows 8 and Windows Phone 8 platforms using Microsoft's industry standard C# programming language. Windows 8 is the latest version of Microsoft's desktop operating system, and now it has been extended to cover tablet and other touch-screen devices too. Windows Phone 8 is the new iteration of Microsoft's powerful mobile computing platform with huge potential for gaming: always in your pocket and with "instant on" capabilities, the promise of gaming on the move is a reality with Windows Phone devices. Both of these platforms provide ideal environments for .NET developers looking to create fun, sophisticated games for large audiences. Windows 8 and Windows Phone 8 Game Development will guide you through all of the stages required to develop your own games using C# and MonoGame (an open-source replacement for XNA) using either the free Express or the full versions of Visual Studio 2012. You'll be guided from setting up your development environment through to a range of different 2D and 3D graphics techniques, sound and music, user input options and more. Finally, you'll receive instructions on distributing your applications through the Windows Stores for both Windows 8 and Windows Phone. All of the development tools you need are available free of charge so there is really nothing stopping you creating your own games! Gain insight that will allow you to take full advantage of Windows 8 and Windows Phone 8's gaming capabilities. Windows 8 and Windows Phone 8 Game Development is aimed at those with an existing background in programming and knowledge of one of the two main .NET programming languages (C# or VB). No prior knowledge of programming for Windows 8 or Windows Phone 8, XNA, MonoGame or programming games in general is needed. This book will guide the reader through the steps required to become proficient in all of these areas of development. 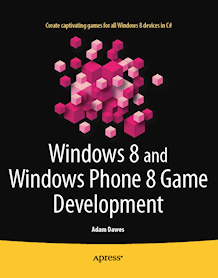 Windows 8 and Windows Phone 8 Game Development is published by Apress.